The Speck Blog: These elementary school students used Speck to launch an anti-idling campaign! These elementary school students used Speck to launch an anti-idling campaign! Utah has experienced some of the worst air quality in the entire United States! The particle concentration in Utah is consistently higher than most other cities (especially this past February). One school in Salt Lake City has taken matters into their own hands - thanks to the hard work of Quail Hollow Elementary and Speck! About a year ago, Quail Hollow Elementary borrowed Speck monitors. 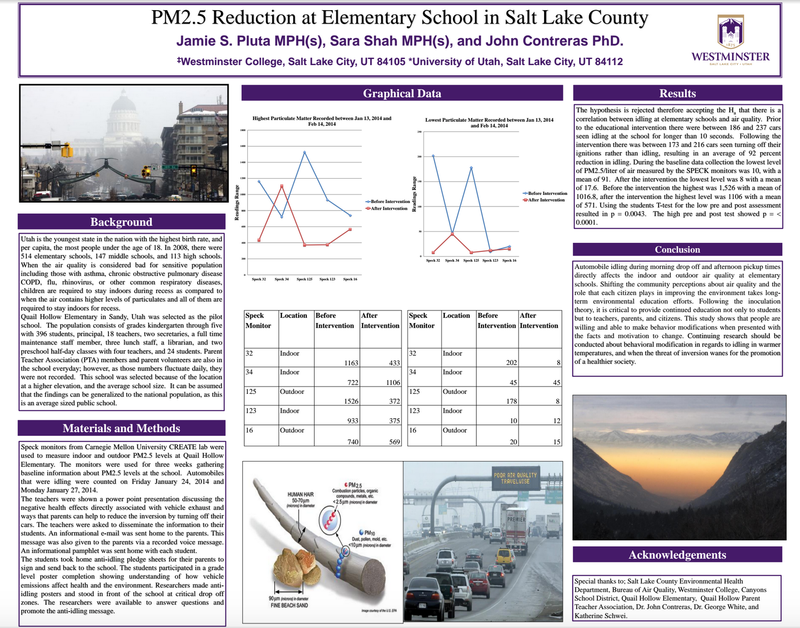 For three weeks, students used Specks to gather baseline information about vehicle pollution and PM 2.5 levels (which turned out to be quite high) at the school and counted all cars that were idling during drop off/pickup times in front of the school between January 24, 2014 and January 27, 2014. Students then learned how to talk about air pollution with their parents and took home an air quality informational packet and an anti-idling pledge sheet - thus launching an anti-idling campaign! Photo from http://quailhollow.canyonsdistrict.org/. Look how beautiful that background is! After a number of parents signed the anti-idling pledge sheet, they started to carpool and/or turn off their car engines during drop off/pickup times. After seeing this change in behavior, students used Specks again to measure vehicle pollution and counted the number of cars outside of the school. 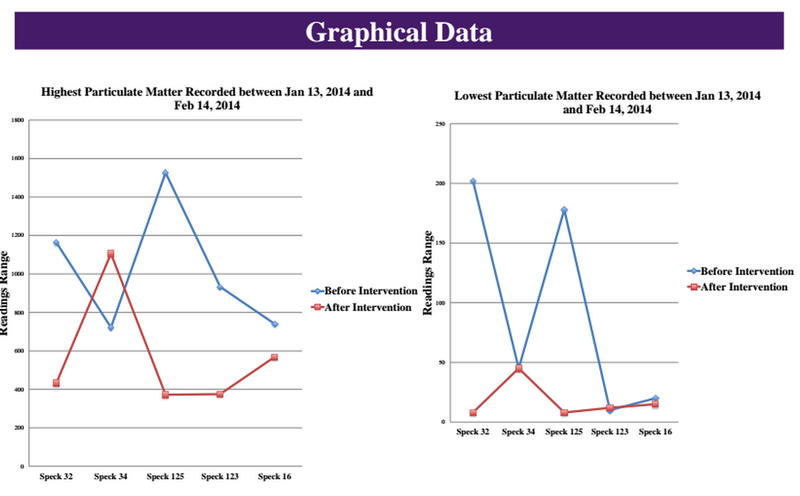 Below is a chart of Speck data collected by the elementary students before and after the anti-idling campaign. 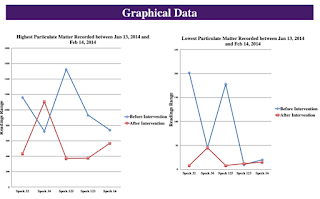 Results: The anti-idling campaign worked! 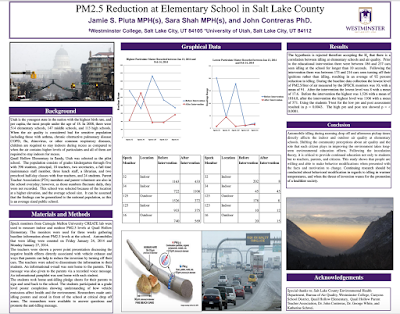 Vehicle emission directly effects the indoor and outdoor air pollution in the school. The best part? Elementary school students used Speck technology to make a direct change to their community and promote a healthier society! How SPECKtacular!